Here at Taxware Systems, we want tax professionals to stay informed about the tax industry at large, including important information from the IRS that will help the tax season run smoothly. The IRS recently announced that the official start date for 2017 filing season, and the day they will begin processing returns is Monday, January 23rd. Note: There is no advantage to filing paper returns early in January because the IRS will start processing all returns at the same time. The IRS also wanted to remind taxpayers that due to the PATH Act, a new law dictates that the IRS is required to hold refunds claiming Earned Income Tax Credit (EITC) and Additional Child Tax Credit (ACTC) until February 15th. Please be patient; it will take several days for these particular refunds to be released and processed through various financial institutions. We hope that this information is helpful as you prepare for another successful tax season. During the holiday season, people often donate money, personal belongings or property to charity. Here are some tips that you can share with your clients to help them file their tax return. Qualified Charities: The client can deduct gifts for a qualified charity. This includes churches, synagogues, temples, mosques and government agencies, even if they do not appear on the Select Check tool provided by the IRS. Note: Warn them to be careful of phishers posing as qualifying charities. Do not open emails from a “charity” that is not familiar, and do not click on any links in the emails. The Select Check tool should be able to help you confirm actual charities. Keep Records of All Cash Gifts: Gifts of money include those made in cash, checks, electronic funds transfer, credit card or payroll deductions. Make sure they ask for written statements or bank records from the charity. The statement must show the name of the charity, date and the contribution amount. If there are payroll deductions, have them retain a paystub or W-2 form from their employer. Additional Records: The client needs to get an acknowledgement from the charity for each deductible donation, cash or property, of $250 or more. Year-End Gifts: Deduct contributions in the year that they are made. If the client charges a gift to a credit card before the end of the year, it will count for 2016. The same is true of a check mailed in 2016. Special Rules: If they give a car, boat or airplane to charity, special rules apply. Be sure they fill out Form 8283 Noncash Charitable Contributions, to report these gifts. https://www.irs.gov/uac/about-publication-526 or call the IRS at 1-800-829-1040. 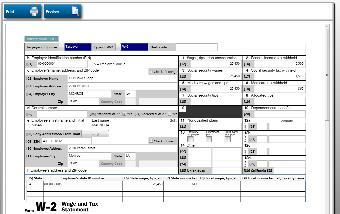 The W-2 Input page has been modernized. 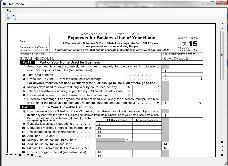 We have put special focus on the flow and tab order of the W-2 page. The W-2 follows the IRS W-2 form. We have added the wizard mode button so that you can turn the wizard flow on or off any time, whether you are in edit mode or enter a new W-2 transaction. This is the next evolution to our forms preview and constant calculations. Designed primarily for you dual or large monitor users, hitting the F12 key will open the live view window. This can be dragged to a second monitor or space on a large monitor. For supported forms, this will then display the active form or schedule. As dollar amounts are changed and calculated the PDF will be instantly updated, giving you even more tax return information at your fingertips. We have enhanced our outstanding e-file tracking system even more. 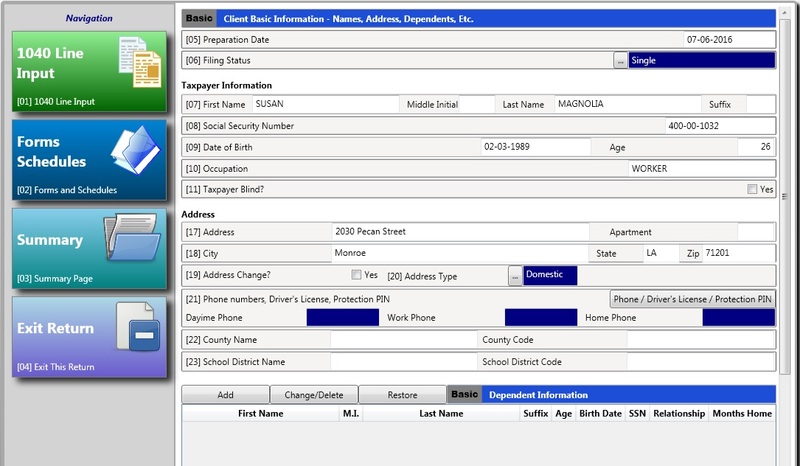 The new system will now handle an unlimited number of state records, integrate seamlessly with the client data grid and includes an A2A server database tab. The new A2A server tab will show you a two week history of an individual tax return’s e-file A2A progress. Also, in these individual data records, acknowledgement files can be re-hung for download and processing. This can still be done through our website but can now also be done here without ever leaving the program. I have just scratched the surface of the new program and its capabilities. Our posted video will give you a better overview of the new program, so we encourage you to check it out: http://www.taxwaresystems.com/productwintax.html. We are excited about the new Wintax program. It opens the door to so many additional opportunities for future goals and tools. Although we are very excited about the new program, we are also cautious. We will continue to support and enhance our legacy Wintax program. The new program is in a pilot or test year and is limited in state support as well as native forms and schedules. The program natively supports CA, IL and UT and uses the legacy program to support all the other states and federal forms that are not native to the new system. However, most of the other federal forms and schedules are available by linking the new program to the legacy program in the Defaults and Settings page. Taking advantage of some of the latest programming tools available, we have rewritten our Wintax-1040 Income Tax programs. We wanted to develop dynamic systems with a more user-friendly experience but keep our existing tax return flow so that there wouldn’t be a learning curve. We believe we have hit the mark with this new Wintax program and are excited for its launch! Enhanced Windows 10 user interface, fully maximized screen and overall more user-friendly experience. Defaults and Settings have been moved to their own page. For most clients, Taxware’s standard defaults are adequate and typically do not require adjustments. Native Print Printing is even faster. User Interface Scaling This can be done on any page by CTRL mousewheel up or down. You can also go to the Defaults and Settings page and use the scaling slider. The scaler will remember whatever it was set to last when you exit the program. Easier Networking Available networked drop down as well as networking filter. The network name is now part of the operating system’s client storage and gets ported into the client and e-file databases. This means you can easily switch to another network client’s settings, and that you can also filter clients based on your network ID. If you are not networking, simply uncheck the “Enable networking user filter” selection and the “User Filter” goes away. Tax returns’ network ID gets set during new client or prior year recall but can be reassigned in the print configuration menu. “Bread Crumb” Navigation is awesome! Now you can know where you are in the tax return all the time. What makes this feature really fantastic is that clicking the blue titles can also be used to go straight to a specific page. E-file Validation is now native to the new program. The internal and IRS schema validation for the federal takes place during the loading of the validator. We also have color coding of the XML, copy and paste functionality, and search XML utilities. E-file tracker has a new Station ID filter. If networking computers or station ID EROs that intend to share the program, a station ID can be entered and the new e-file tracker will filter their tax returns. There are too many fun things to talk about regarding the new program, but I’ll talk about a few of the highlights. Note: We are not discontinuing our fantastic current legacy 1040 program, so if you are more comfortable using the legacy program it is also being added to and enhanced. We are really excited about the new, enhanced recall client page. On this page, clients can filter the tax returns to show only tax returns for the selected filter by clicking the filter buttons. The search options located to the left will search the filtered data set. This should make finding and working with your clients a lot easier and faster. Also from this page, the new client wizard can be accessed to start a return by selecting the new client button located in the tool bar. For clients that have been recalled into the current year, expanded client information can be accessed by searching for the client and hitting the F2 key or clicking the F2 button. This page provides a quick snapshot of the tax return. Client basic information, direct deposit information, amounts refunded or owed, amounts billed and owed, and a quick summary of the electronic filing status of the federal and state returns is available. For electronically filed returns, acknowledgement files can be printed right from this expanded information page. 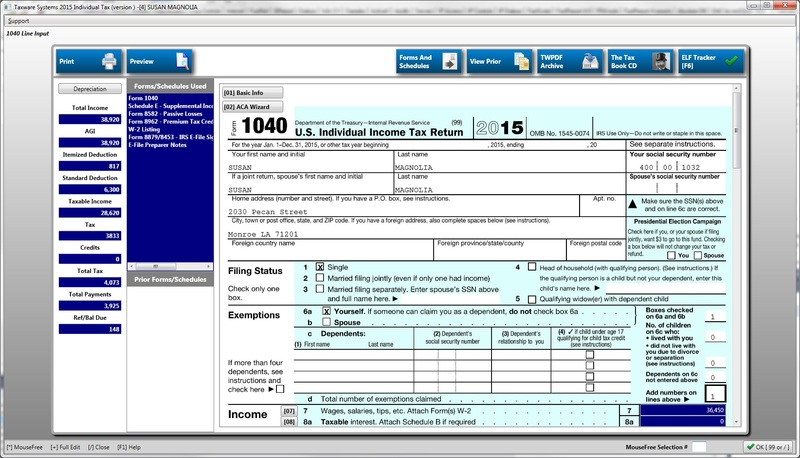 This page is the main launch point of the federal tax return and the federal form 1040 is the main design flow for this page. Constant total calculations are shown in the left panel. Forms and schedules used are displayed in the middle panel and those forms or schedules can be accessed by double clicking those forms. The main forms and schedules item selections are found in conjunction with the line numbers of the 1040. We also added specific page access if that line is clicked with your mouse. We also included our Form Search capabilities that had previously only been available in our direct Forms and Schedules page. Do your clients have ITINs, or Individual Taxpayer Identification Numbers? The IRS issues an ITIN to those who need to file a tax return or report to the IRS, but who are not eligible for a social security number, and some of those ITINs expire at the end of 2016. If your client needs to renew an ITIN, complete an application this fall to avoid delays. Form W-7: The Form W-7 is the application for the IRS Individual Taxpayer Identification Number. The client must have identification documents with the form, but they do not need a completed tax return. Other documents are eligible to show proof of foreign status as well. For a full list, please visit www.irs.gov. Note: Only original documents or certified copies are accepted. U.S. medical records for dependents under age 6 or U.S. school records for dependents under age 18. U.S. school records for dependents age 18 or over or a rental statement, utility bill or bank statement with the applicant’s name and U.S. address. To claim certain credits and ensure a timely refund, make sure they renew their ITIN before filing taxes. For more information, please visit www.irs.gov.